Seeing ants inside your house lately? 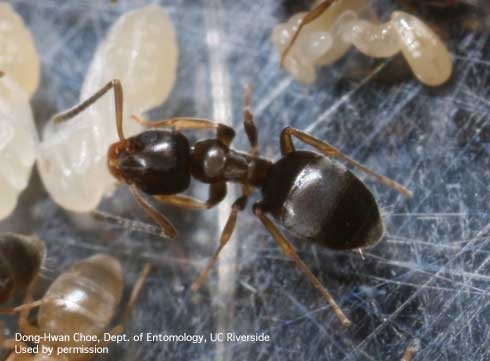 As Californians enjoy the long-awaited rainfall, something linked to rain is not as welcome: ants. One such ant we see headed indoors during rainy conditions in California, is the Argentine ant. The Argentine ant is about 1/8 of an inch long and dull brown in color. It's normally found living in the landscape in shallow nests, and might even be living just outside your building. When rainy weather floods their nest, Argentine ants may use your home or office as a warm and dry place to relocate. Inside buildings, household ants (Argentine or other species) feed on sugar, syrup, honey, fruit juice, fats, and meat. Long trails of thousands of ants may lead from nests to food sources, or you may just see stragglers which are scouts looking for food or places to nest. You may find ants in your kitchen, bathroom, office, and other places. This rainy season, before ants have a chance to invade your home, be proactive and “ant-proof” your buildings ahead of time Determine what the ants are attracted to and eliminate the food or water source. Monitor the places in and around your home where ants are often found. Follow ant trails to find where they are entering, and seal them off using caulking or other sealants. 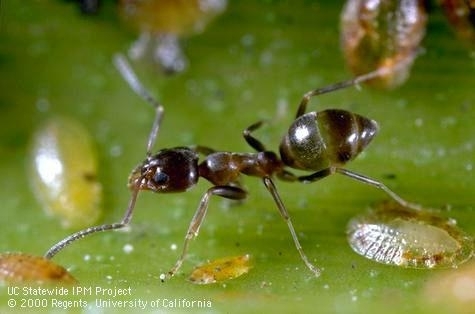 Of the 270 species of ants in California, fewer than a dozen are pests, and although ants can be bothersome pests indoors, it's important to remember that outdoors they sometimes also play a beneficial role in the environment. Visit the Ants section of UC IPM's home and landscape web pages for more information about preventing or managing ant invasions. There you will find videos about ants including, “What to do if you have an ant emergency” and “Why do ants invade?” as well as other resources to help identify ants and know what to do indoors or out.